Situated within the sumptuously elegant Charters Development, formerly the DeBeers estate, Hamptons International are pleased to present to the Lettings Market this generously proportioned two bedroom property offering the highest of specifications. Located on the first floor with far reaching views over wonderful parkland exclusive to the development the apartment briefly comprises of an entrance hall, cloakroom, drawing/dining room, kitchen, master bedroom suite, second bedroom suite and private balcony. There apartment also benefits from underground parking, 24 hr security, concierge and spa complex. The spa facilities at the development are truly exceptional with use of treatment rooms, swimming pool, Gymnasium and more. Offered on a furnished basis, the property is ready for immediate occupation into the wonderful lifestyle that only the Charters Development can provide. 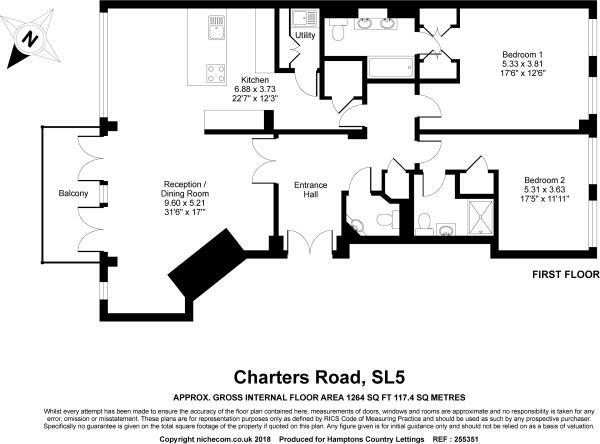 This property is marketed by Hamptons International Lettings, Sunningdale at £4,500 per month. Rightmove has calculated the price per week for comparison purposes only. Property reference P179709. The information displayed about this property comprises a property advertisement. Rightmove.co.uk makes no warranty as to the accuracy or completeness of the advertisement or any linked or associated information, and Rightmove has no control over the content. This property advertisement does not constitute property particulars. The information is provided and maintained by Hamptons International Lettings, Sunningdale.